Before the 2018 Range Rover Velar arrived on Vancouver streets, the iconic British SUV brand had a big financial gap between its $49,990 Evoque and $78,800 Range Rover Sport. Now, however, the $62,000 Velar fills the dollar void as well as the size differential, as it’s parked right on the upper edge of the compact luxury SUV segment. Compact? True the Velar, like the Jaguar F-PACE it shares chassis architectures and drivetrains with, is large enough that it borders on mid-size. It measures 4,803 millimetres in length with a 2,874-mm wheelbase, 1,665 mm tall and 2,145 mm wide with its mirrors extended, while its track spans 1,642 mm up front and 1,657 mm at the back. That makes it slightly longer and taller than the F-PACE, albeit a smidge narrower, with its wheelbase identical and track fractionally wider, yet it’s 76 mm shorter than the mid-size Range Rover Sport overall, with a 49-mm shorter wheelbase, 138-mm lower height, 75-mm narrower width, and 51/29-mm narrower front/rear track. I could go on comparing, but suffice to say the Velar is a large compact. From outside the Velar looks every bit the part of a sleek, wind-cheating modern-day Range Rover, my all-black R-Dynamic HSE P380 tester certainly seeming more focused on go-fast performance than rock crawling and mud slinging. Of course, that’s the way we see most Range Rovers that drive by, despite their terrain conquering legend. True to reality my tester was kept to tarmac, this Velar’s optional glossy black-painted 22-inch multi-spoke alloys on 265/40 performance rubber better suited to lanes confined by painted lines and guardrails than trees on one side and cliffs to the other. The word displays is plural for a reason, the Velar infused with the new InControl TouchPro Duo infotainment system. The topmost 10.2-inch widescreen monitor is amongst the segment’s best for clear, crisp quality and graphical stimulation, even canting towards the driver upon startup, but it’s the secondary display, integrated within the sloping console’s mid-section, that truly wows. Along with its inclusion of climate and seat controls plus plentiful vehicle settings such as the SUV’s Terrain Response system, it minimizes switchgear and thus cleans up the interior design, the result more minimalist than the Germans. There are knobs, two for the HVAC system and one for audio volume, but most everything else is under glass, so to speak, the fourth dial for gear selection in recent Land Rover tradition. So is getting comfortable, and the Velar offers a wide variety of front seat options to do so. Perforated grained leather is standard, while the inherently comfortable 10-way powered front seats get standard memory. Interestingly, seat heaters are a $510 option with rear warmers added for another $510 or, better yet, front cooling seats for just $310 more, but before I get bogged down in minutia I’ll leave the price of each upgrade, or for that matter the itemization of any such upgrades, to Land Rover Vancouver’s competent sales staff, and instead focus in on the SUV at hand. As noted earlier, Land Rover provided my Velar tester in R-Dynamic HSE P380 trim, which from a comfort perspective (the HSE part) means that standard items found on the $62k base Velar S, such as 19-inch five-spoke alloys, colour multi-information display amid analogue gauges, grained leather, 10-way memory seats, 11-speaker Meridian audio, and more gets upgraded to 21-inch 10-spoke alloys (which as noted were replaced on my tester), the 12.3-inch high-definition Interactive Driver Display (also mentioned earlier), the supple Windsor leather, yet more comfortable 20-way front seats with the addition of standard heat and cooling functions plus (ahhh) massage that was wonderfully relaxing, and six more side and rear speakers plus a dual channel subwoofer and Trifield technology for the Meridian audio system. Other items pulled up from base to HSE trim include LED headlights with signature DRLs and auto high beams, auto-dimming and power folding, heated side mirrors with approach lights, proximity access, pushbutton ignition, an electromechanical parking brake, rain-sensing wipers, an auto-dimming rearview mirror, a garage door opener, a sliding panoramic glass sunroof, voice activation, a rearview camera with dynamic guidelines, rear parking sensors, Navigation Pro GPS with brilliantly detailed mapping plus the ability to actually learn your regular routes and then update with traffic and ETA info as needed (this is really helpful during Vancouver’s seemingly continuous rush hour), Autonomous Emergency Braking (AEB), a powered gesture liftgate, and the list goes on and on. Some features found on the HSE that are optional with the base model include larger 350-mm front brakes, front parking sensors, a power-adjustable steering column, bright metal pedals, Adaptive Cruise Control with Queue Assist and Intelligent Emergency Braking, Blind Spot Monitor, Lane Departure Warning, Lane Keep Assist, Reverse Traffic Detection, Driver Condition Monitor, Traffic Sign Recognition and Adaptive Speed Limiter, and Park Assist. Of course you can add plenty more, with items still available including myriad alloy wheels, roof rails and cross-members, a heated windshield, illuminated treadplates and cargo sill, cargo storage rails, premium floor mats, plenty of hardwood, metal and piano black lacquered inlay options, extended leather, unique Dapple Grey wool seat and armrest upholstery developed by Danish textile supplier Kvadrat (they also supply to premium furniture brands Knoll and Vitra), Suedecloth steering wheel rim and headliner, satellite radio, dual 8.0-inch rear entertainment monitors on the backside of each front headrest with a DVD changer, and a Tow Package with a hitch receiver, fixed rear recovery eye, Advanced Tow Assist that automatically steers in order to control the position of the trailer when backing up (allowing 2,500 kilograms of trailer weight), and a surround camera system (the latter available as a standalone option as well), etcetera. Finally, $95k First Edition trim (limited to just 50 units in Canada) adds unique exterior and interior treatments to the R-Dynamic HSE P380. Knowing the Velar shares aluminum-intensive underpinnings with the Jaguar F-PACE, and more so that my R-Dynamic P380 tester is dynamically similar to its British cousin’s quickest trim level, titillates the senses before even setting out. After all, the fastest F-PACE S is one energetic performer with particularly athletic road manners, so it only makes sense that the identically formidable Velar should deliver the same results. On paper that’s mostly true, other than 0.2 seconds added to the more opulently attired Range Rover that sprints to 100km/h in 5.7 seconds instead of 5.5. Considering the Velar’s more luxuriously appointed interior and greater assortment of standard features I’m just fine with that, the difference so nominal it would take some pretty sophisticated timing hardware and a side-by-side drag race to confirm, while each model’s top speed of 250 km/h is out of the question on Canada’s public roads so it’s a moot discussion, but really the more blatant differentiator is the way each SUV goes about delivering its performance. Where the F-PACE S is a rasping, growling performance machine that purposefully embraces the F-TYPE sport car’s track-conquering pedigree, the Velar R-Dynamic HSE P380 is an altogether quieter, more refined, more sophisticated experience. 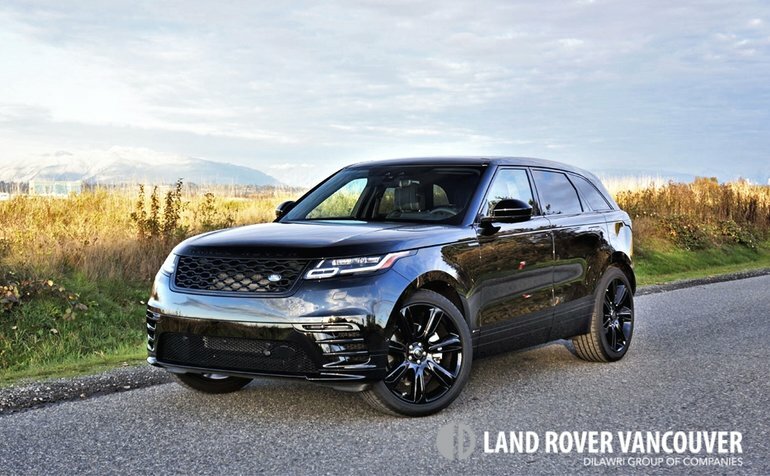 As noted by the numbers, either version of the Jaguar Land Rover 3.0-litre supercharged V6 gets up and goes as if shot from a catapult, 380 horsepower and 332 lb-ft of torque fed through an eight-speed automatic transmission with paddle shifters being more than enough for these grand albeit still compact SUVs, yet the Range Rover flies forward with an entirely new level of grace and composure. This is high-speed motoring at its best, and while I never had opportunity to test its off-road mettle I’m willing to guess the Velar is every bit the low-speed adventurer that its older, larger siblings are. Aforementioned Terrain Response lets you dial in performance settings based on any number of road/trail and weather conditions, while its available air suspension (standard with the P380) adds 46 millimetres of ride height for more extreme 4x4 situations. It’s a dream around the city too, easy to negotiate in congested traffic and nicely sized for parking, while its excellent visibility helps to see over surrounding cars. Those less interested in straight-line performance and more concerned with economy will appreciate that Land Rover employs its in-house designed and built 2.0-litre Ingenium turbo-diesel as standard equipment, good for a reasonably quick 8.9-second run to 100km/h thanks to 180 horsepower and 317 lb-ft of torque, plus a claimed 9.2 L/100km in the city, 7.8 on the highway and 8.5 combined, whereas the sportier V6 alternative uses a still commendable 13.0 L/100km city, 10.0 highway and 11.6 combined thanks to fuel-saving auto start/stop that shuts the engine off when it would otherwise be idling, and other efficiency systems. Speaking of efficiency, the Velar’s large compact dimensions make for five-seat comfort in all positions, while 558 litres of cargo space behind the rear seats (or 673 litres when measuring above the cargo cover) is good for the class. Also helpful, the rear seatbacks fold in the most convenient 40/20/40 configuration, allowing longer cargo like skis down the middle with passengers in the more comfortable (and in my tester’s case, heated) window seats, while there’s up to 1,985 litres of cargo space available when they’re laid completely flat via those handy optional levers noted earlier. Land Rover has thought of everything with the new Range Rover Velar, making it my choice for best compact luxury SUV in Canada.